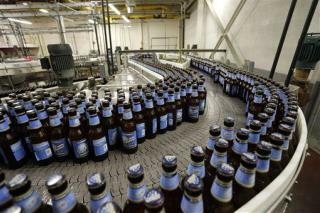 (Newser) – A California judge says he's inclined to dismiss a lawsuit claiming MillerCoors deceptively marketed Blue Moon as a "craft beer," though the plaintiff in the case can still present new evidence. Evan Parent filed a class-action lawsuit against the brewer after discovering that Blue Moon wasn't actually brewed by "Blue Moon Brewing Co." as its label indicated, but instead by MillerCoors. In a tentative ruling last week, US District Judge Gonzalo Curiel said there's no regulation keeping MillerCoors from placing Blue Moon Brewing Co. on Blue Moon's packaging because the brewer filed the necessary paperwork with California's fictitious business name registry, reports Courthouse News. Curiel also noted that MillerCoors' website lists Blue Moon as its own craft beer. Here is your first clue it is not a craft beer if you can buy it at every store in town or the state it is not a craft beer! I don't how this judge lives his life but I myself don't run home to pull up Miller Coors (or any other brewer) website when I begin perusing the options in the beer cooler at ABC Grocers. I recently read an article about 'indie' brands which were not actually indie brands. Many started off as independent small companies but were silently bought out by large corporations and have remained with the same labelling. Some on the list I knew, but others surprised me....and they certainly go out of their way to maintain the 'craft' or 'indie' impression. The Body Shop (L'Oreal) Burts Bees (Clorox) Toms of Maine (Colgate Palmolive) Kashi (Kellogs) Honest Tea Company (Coca-Cola) ...and many more http://www.willcookforfriends.com/2013/07/50-brands-you-didnt-know-were-owned-by-big-businesses-fak-friday.html I'm not against the acquisitions, however it's a bit deceptive to consumers, especially when the core product's original selling feature is changed. These days you really need to read the labels thoroughly to know what you're getting, and you can't count on a few marketing key words in the label, or the 'look/feel' of a product to gauge what you're actually getting.